9th annual West Seattle Community Garage Sale Day: Registration begins! Did we mention – here’s the link! More than 120 sales are now on the map for West Seattle Community Garage Sale Day 2012 – the six hours (9 am-3 pm the second Saturday of May, which this year is May 12th) when our peninsula turns into Garage/Yard/Rummage Sale Paradise. We are now six days away from the official registration deadline – 11:59 pm next Wednesday (April 25th). That cutoff gives us just enough time to make the maps (which will be ready a week before WSCGSD) and launch the final round of promotion with something resembling an accurate total. **NOT ENOUGH ROOM OR STUFF FOR YOUR OWN SALE? Hotwire Online Coffeehouse and C & P Coffee Company (both WSB sponsors) are once again offering courtyard/yard space for small individual sellers. Inquire at either coffee shop (4410 California is Hotwire, 5612 California is C&P) or by e-mail – info@hotwirecoffee.com or candp@comcast.net. Again, next Wednesday night is the deadline to sign up! Finally ready to go. Here’s the registration form. Everything is the same as last year – registration fees (we haven’t changed those since we knocked them down a notch when we took over WSCGSD in 2008), for example. Be sure to have all the info ready when you sign up – including what you want the ad for your sale to say in the map packet – even though it’s six weeks away, you probably know what your sale’s going to be about! And be sure to choose the right category for your sale in the dropdown box toward the start of the form. See you out there 9 am-3 pm Saturday, May 12th! Watch for news here sometime this afternoon or evening – soon as we make sure the form is in “all systems are go” mode. We’ll announce it in all WSB/WSCGSD channels (Web, Facebook, Twitter, etc. ), so don’t worry, you won’t miss it. 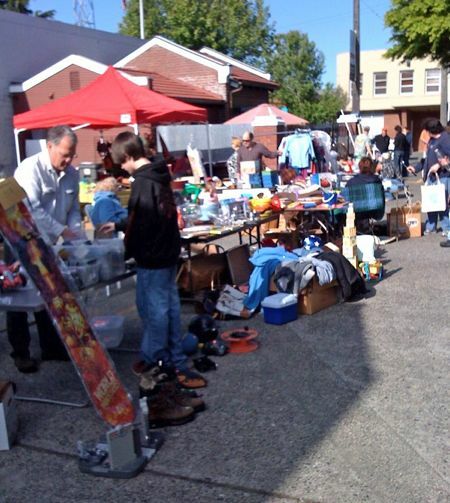 2 months till West Seattle Community Garage Sale Day 2012! Time doesn’t just fly … it roars … it zooms … it is a blur. And here we are, two months away from West Seattle Community Garage Sale Day 2012, which will be 9 am-3 pm on Saturday, May 12 (always the second Saturday). We’re currently planning to open registration on April 2nd. More to come! Registration closed – now, time to get ready for Sale Day! If you’re one of the 240+ sellers (not even counting the people participating at group sites like Hotwire and C&P) who’ve already signed up, thanks and we wish you tons of success! If not – we’re sorry to say, registration is closed, but it’s going to be one whale of a sale day! Don’t have the precise count but we’ve definitely passed 200 sales signed up for West Seattle Community Garage Sale Day 2011 – coming up 9 am-3 pm May 14th! And there’s still time to sign up – follow the “how to register” tab here. Deadline is 11:59 pm tomorrow (Wednesday) night. As of early Thursday, 51 sales are already registered for West Seattle Community Garage Sale Day 2011! And there are three group spots so far – in addition to Hotwire Online Coffeehouse in The Junction (contact owner Lora for a space), the VFW Hall in The Triangle will also open its doors (contact commander Ron Zuber), and if you have a bike or other gear to sell, get a hold of the folks at Cycle U in The Triangle. Day and a half into registration, 33 sales already for WSCGSD 2011! 29 hours after opening registration for West Seattle Community Garage Sale Day 2011, 33 sales are already signed up! That’s ahead of last year’s pace. One participant told us it’s a great excuse to get going with the spring cleaning. And … registration is open for West Seattle Community Garage Sale Day 2011! Full details are on our main site, West Seattle Blog – but if you know how this works and just want to get to the registration page, here’s the link (registration is online-only again this year). Sale day is 9 am-3 pm Saturday, May 14th. Note that we have a new option on the form this year – if it’s OK to just e-mail your info-packet materials instead of postal-mailing them, please click the appropriate button. Otherwise, the fees are the same for the fourth straight year. As of this writing, registration’s just been open a few hours and we already have a dozen signups – last year we had more than 200 sales, so we’ll see what happens this year! Check back here Monday, April 4th, (also at West Seattle Blog, the WSB Facebook page, and the WSCGSD FB page) for the registration kickoff! Unofficial tally for 2010 WSCGSD sales: ~190 !!!! After we get through a few stories-in-progress over at West Seattle Blog this morning, we’ll be taking a more official count of all the sales signed up for the sixth annual West Seattle Community Garage Sale Day – but our unofficial tracker says about 190 – definitely a new record, since we were in the low 180s last year. Thanks to everyone who’s participating! We’re still 2 weeks out (two weeks and one day, to be exact) but you’re invited to share info about your sale on the official WSCGSD Facebook page – photos, info, whatever, there’s not a ton of official info to share between now and then (we’ll be sending your postal mail packet) so that page is for participants as much as anyone. “Like” it here, if you haven’t already done that! Last day to register – more than 150 sales so far! Thursday night’s the registration deadline. We’ve passed 120 sales, big and small … that doesn’t count the dozens of individuals who are participating at the group sites. Sign up online – starting here. Countdown to registration deadline for 2010: Ninety sales so far! … which is about exactly where we were at this time last year … so no worries about procrastinating, it’s the perfect time to register! Or, if you are looking for a group site, check in with Hotwire Coffee (shown above in photo from last year) or C & P Coffee, both of whom had offered courtyard space to people who needed somewhere to set up. Registration closes at the end of the night next Thursday 4/22, and in the meantime, the annual promotion blitz is about to start – posters, ads, etc. Again, Saturday, May 8, is sale day, with as many sales as people register, big and small, all over the peninsula, 9 am-3 pm is the official sale time period. Thanks for supporting the 6th annual West Seattle Community Garage Sale Day – register your sale with the online form you’ll find here! Almost 60 sales so far for 2010 West Seattle Community Garage Sale Day! Registration is going great – we are now into Week 2. Just about time to start papering the town with posters etc. But in the meantime, signed up your sale yet? Great way to deal with the results of spring cleaning. And remember that Hotwire Coffee (West Seattle Blog sponsor) and C & P Coffee are both offering space – free unless you want a separate ad on the map for your setup at either place, in which case, please sign up as an individual and be sure we know that’s your sale site. Thanks for supporting the 6th annual WSCGSD! Four days into registration, 30+ sales for 2010! More than 20 sales signed up so far for WSCGSD 2010 – you’ve got till April 22 to register but why wait? It’s live – go here. Note that the prices and categories are the same as the past two years. We’re aiming for about 8 am but depends on whether the form behaves. Check back here (or on WSB, or Facebook, where we’ll also update our West Seattle Community Garage Sale Day page as soon as we’re ready to roll) later! That’s a big jump from last year, when we only hit 100 on the second-to-last day to register, so #110 was in the final batch … OK, OK, so we have a longer registration period this year. Still, it’s only natural to wait till the last moment. Now, a few reminders: When you register, please make sure you give us the correct mailing address, and indicate if the sale is at a different address – we are mailing everybody a packet, with your “official participant” sign plus some other information, and we need to make sure that gets to you well in advance of sale day. Also, just so you know, we are continuing to place ads around the area so as we move from registration to the two-week pre-sale publicity push, there shouldn’t be a bargain hunter within 100 miles who hasn’t heard of WSCGSD. So – you signed up yet? 11:59 pm next Saturday (April 25), we need to have your registration in hand – either online (which means if you start registering by, oh, say, 11:50 or so that night to get through the form and PayPal, you should be more than golden) or by postal mail (we’d suggest sending the form no later than Thursday) … We have those courtyard sales at Hotwire and C & P Coffee (check if there’s still room), we have school sales (including Roxhill and Gatewood Elementaries), block sales, estate sales, and dozens of great individual sales. Want to make a few extra bucks? Clean up and sell out! Er, outside, we mean. 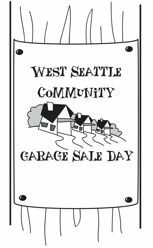 9 am-3 pm Saturday, May 9th, is the date/time for the official West Seattle Community Garage Sale Day – our second year coordinating it, but this is the 5th annual WSCGSD! 3 weeks till WSCGSD – 1 week left to register! … and we haven’t even been to the mailbox yet today. But online registration is the way to go – see the tab above. We were asked at last night’s Pigeon Point Neighborhood Council meeting, so what do you get for your registration fee? Regional promotion – including your spot on The Map, and an “ad” of up to 10-words on The Map. As we’ve mentioned before, this is the FIRST major community-wide garage sale day in Seattle this year, so bargain-hunters will be dying to get out and shop (not to mention, economic belt-tightening makes garage saling more popular than ever). West Seattle will be THE place to be on May 9 — be part of it! First come, first served for the 20 spaces in the Hotwire Coffee courtyard on Garage Sale Day!!!! Also offering space if you don’t have room for your own sale, C and P Coffee. And don’t forget that signups are in full swing – more than 30 sales signed up now! Here’s how you can sign up too. Great 1st weekend for West Seattle Community Garage Sale Day registration for 2009 — 25 sales registered, including several group/block sales! Both are reachable through their shops, with info at their websites. In addition to an extended registration window (three full weeks this year), we’re adding another time-related improvement: More time to get/review the map. We’ll be promoting West Seattle Community Garage Sale Day at the Sustainable West Seattle Festival on the preceding Sunday, May 3, so it makes perfect sense to have the map ready in time to hand out at the festival — extra days to review it and plot your sale travels! Ready to sign up? The forms are linked here (and within a day or two, we will also have a few locations listed for you to pick up a form in person, if you prefer). And if you’re on Facebook – where West Seattle Blog has a lively group of friends as “WS Blog” – we’ve just created a WS Community Garage Sale Day page that you can “become a fan” of and participate in: Find it here. Online registration form now available for West Seattle Community Garage Sale Day! In addition to the special in-person deal we’re offering if you come by and sign up in person (bring cash or check) at the Gathering of Neighbors today, we’ve also just launched the online registration form – find it here. Or, if you prefer to print out a form and mail it in with your check, here’s the form you can use to do that (don’t try to print out the online form linked above – its special configuration won’t work that way). Any questions? Leave a comment here or e-mail garagesale@westseattleblog.com – thanks! Registration is closed – now it’s time to talk Garage Sale Day! We won’t have a final count till Monday’s mail rolls in (figuring that any forms postal-mailed on Friday may not make it in till then), but we know the number of sales registered for West Seattle Community Garage Sale Day on May 10 has passed 140 — this is going to be a blast! Registration IS closed; the online form is deactivated, and mail-in forms would have had to be postmarked Friday. Now it’s time to start shouting the news all around Puget Sound — we’ve already got a variety of announcements out but more to come — whether you’re a shopper or seller, how about you invite friends/relatives from other areas to come to West Seattle and have a blast garage-saling on May 10? Maps will be available online and at designated pickup spots (we will post the list over the weekend) May 8. And we’re now assembling packets for participants – those will go out in postal mail within a few days. More WSCGSD news later today! P.S. If you want to get in the sale mood, the St. John the Baptist Episcopal Church 2-day rummage sale continues 9 am-3 pm today (and next Fri-Sat too). WSCGSD hits 100, on 2nd-to-last day to register! Our 100th registration just came in! You can still sign up your sale as long as you do it by tomorrow night. (P.S. We know some people have had trouble with the PayPal payment method – which takes major credit cards, you don’t have to be a PP member – so we’ll be contacting you for other options.) QUICK LINKS if you’re not in on West Seattle Community Garage Sale Day yet — Online registration form here, downloadable mail-in form here, list of locations to pick up a preprinted registration form here. 80 sales for WSCGSD ’08, and still growing! Another milestone. That’s an incredible number already, but we’re secretly (ok, not so secretly since we posted it here) hoping to hit 100 before registration closes this Friday night – think of how great that’ll sound in the promotion! We’ve already posted more than a dozen ads in on- and offline publications that are read citywide (and beyond), by the way. Go, garage salers, go!!!! 50 sales signed up so far! The 4th annual West Seattle Community Garage Sale Day on May 10 is continuing to shape up as a great day to shop and sell – we’ve now hit 50 sales, from group-sale sites like Hotwire Coffee and C and P Coffee (stop in to sign up, if you don’t have enough room or items for your own sale), to organization/school sales like the Community School of West Seattle and Log House Museum and North Delridge Neighborhood Council, to dozens of great-sounding individual and block sales! Registration is open for one more week (till 11:59:59 pm Friday, April 25) and then we’ll start talking more about the big day itself, including the “best sign” and “most unusual item” contests, selling and shopping strategy, etc. To sign up your own sale right now (individual, school/business/organization, or block sale) — here are the quick links — Online registration form here, downloadable mail-in form here, list of locations to pick up a preprinted registration form here. We’ve passed 40 sales registered for West Seattle Community Garage Sale Day as of late morning today! Still continuing to find new ways to get the word out (do you have a place to display a poster, where we haven’t already asked to put one up? e-mail us and we’ll bring one over!). 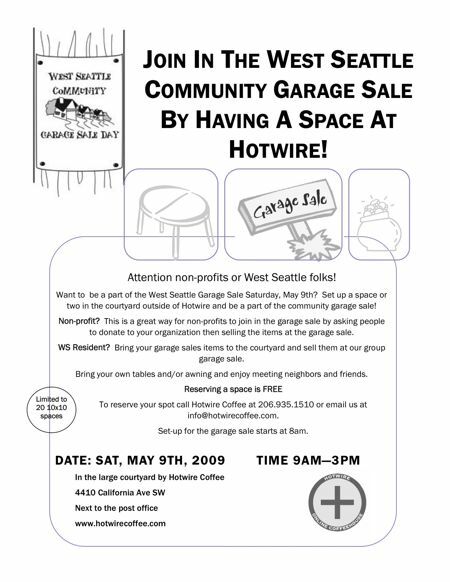 Also, Lora Lewis of Hotwire Coffee (which we’re always proud to note is West Seattle Blog‘s inaugural sponsor) is going to have a space in the courtyard for a group sale – go to Hotwire to sign up; $10 donation requested for Furry Faces Foundation, an animal-advocacy group with strong West Seattle ties. If you’re ready to sign up your own sale (individual, school/business/organization, or block sale) — here are the quick links — Online registration form here, downloadable mail-in form here, list of locations to pick up a preprinted registration form here. Let the sale registrations begin! *Remember to have your 10-word (or less) ad ready when you register – this is how your sale will be described on the printable and downloadable map that will be available a few days before The Big Day. Here it is – the first-ever online registration form for West Seattle Community Garage Sale Day — click here to start. By 10 o’clock this morning, we will also have a Word doc here that you can download and fill out if you prefer to mail in your registration. Registration is open today through April 25; we have to cut it off then so we can start working on the maps and finishing the promotion and making sure this is THE MOST AWESOME WSCGSD EVER! Glad you’ll be part of it. Two days till registration opens! We’ll be making the rounds with posters and sign-up forms on Wednesday, and the link for online registration will go up here and at West Seattle Blog on Thursday. The fees will be $12/individual sale, $20/organization (including schools and businesses), $30/block sale. This gets you in on a ton of promotion and a couple of cool contests (best sign, most unusual sale item). Can’t wait! If you choose to register by mail, please fill out the form as soon as possible after you get it and mail it in — we will also offer the form by download on this site and at West Seattle Blog, but online registration will be the quickest and easiest way to do it. More details here daily! One week till registration starts for WSCGSD! We are finalizing the list of places where you will be able to pick up a registration form in person if you would prefer to mail one in — that will be posted here tomorrow — we’ll probably drop off the forms (and put up some cool posters that are in development now) next Tuesday or Wednesday just to get a jump on things. MAY 10TH, SAVE THE DATE, SELLERS AND SHOPPERS!